Why use ecologically friendly Firestone 1.14mm thick EPDM rubber geomembrane over other types of pond and dam liner? It's because of EPDM's ability to stretch even in temperatures down to -45degC, its low environmental impact in production and use, plus its proven resistance to UV. 36 years of proven performance and still going strong. The first Firestone lining project was installed in the South of Spain in 1973. This 12,000 sq metre irrigation pond/dam is still in service today. Even looking at this very early technology EPDM liner, Firestone expect that it will achieve 60-years. This proven performance gives you the protection expected from a product that has been manufactured in the USA by a huge company dedicated to carrying on the quality tradition established by Harvey Firestone over 100 years ago. Firestone Pondgard EPDM 1.14mm thick black rubber geomembrane is the preferred choice for garden ponds and dams, open canal and channel seepage remediation, potable water, grey water(gray water) and black water storage. It is perfect for lining of water storage dams for collection and recycling of washing or wash-down water in dairy farms using Reclaimed Water Management Schemes (REMS) or dairy effluent management pond systems. Rock Around The Block supply as far away as Derby in the Kimberley region of West Australia for Wastewater Gardens and Ecoscaping in the construction of subsurface wetlands for sewage treatment and septic systems in remote communities by Birdwood Downs Company. Leaking farm dams - Seepage loss from dams can be a substantial problem. 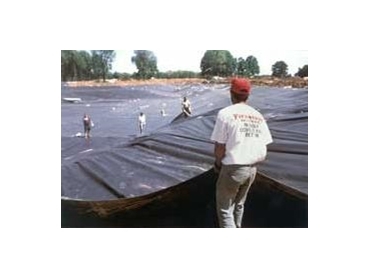 Firestone dam lining EPDM geomembrane liner is now the 35-year proven way to stop leakage from dams. Rock Around The Block supply Firestone dam lining EPDM geomembrane liner in cut-off-the-roll quantities and full roll quantities of 15.2m and 30.4m length. Warning: It is advisable to not use liner membrane systems adjacent to bamboo vegetation because of potential penetration by its sharp pointy shoots. As you can see EPDM comes on rolls in different widths. Cut off-the-roll quantities or full 15.2m or 30.4m rolls of any stocked width can be ordered. Discounts apply for large off-the-roll cut quantities and there are substantial discounts for full rolls.